VCU’s Mo Alie-Cox will look to get his shooting back on track today against the MTSU twin towers of JaCorey Williams and Reggie Upshaw. VCU gets their last shot at a resume-building non-conference win tonight when hosting the red-hot Middle Tennessee State Blue Raiders. It’s a return game in a two-year series that saw a 62-56 Rams road win at MTSU at year ago. Both VCU and MTSU would go on to have great seasons with each advancing to the round of 32 in the 2016 NCAA tournament with MTSU pulling off a huge 15 over 2-seed upset of Michigan State. Both squads will hope to return to the Dance for more damage but in order to do so will need to add to their resume with a win tonight. I’ve written 10 game previews so far this season and MTSU is easily one of the most impressive teams I’ve looked at. In short, these guys do almost everything well. The nation’s 35th most experienced team, MTSU doesn’t hurt themselves like VCU has done early in the year, ranking 4th nationally in turnover percentage offense. That’s a killer for a VCU team that has been one of the most turnover-prone teams in the country and one that relies on a lot of forced turnovers defensively to win games. MTSU plays at a pace that resembles that of drying paint, ranking 318th nationally in adjusted tempo, making the rock fight potential at the Siegel Center tonight extremely high. The Blue Raiders are deliberate and patient and make every possession count. MTSU isn’t a particularly high-scoring team because of their pace but are extremely efficient with a 53.9% effective field goal percentage that thanks 47th nationally. Three of MTSU’s key players are shooting over 40% from three, headlined by second-leading scorer Giddy Potts (15.6 ppg, 42.9% 3p%). Potts is joined by 6’8 Arkansas transfer JaCorey Williams (18.9 ppg, 6.6 rpg) and 6’8 senior Reggie Upshaw (14.6 ppg, 6.7 rpg) as MTSU’s three double-digit scorers and most leaned upon players. All have impressive offensive ratings of at least 113 and all are finishing over 58% of their attempts inside the arc. Defensively MTSU rebounds well, turns teams over and does a nice job of half-court defense. Like VCU however, they have been somewhat prone to high foul counts and can be beaten in the paint. The Blue Raiders are playing their fourth road game over a five-game stretch. They are a perfect 3-0 on the road this season including a 15-point road win at the SEC’s Ole Miss, a 12-point road win at South Alabama and a recent 13-point road win against a tough Belmont team in Nashville. They also boast a 23-point home whoopin’ of Vanderbilt, a kenpom top-100 SEC team they held to just 48 points. MTSU’s one and only loss came at home in their third game of the season, a late collapse against a tough Tennessee State team. The Rams picked up a big road win — or well, arguably THE road win — taking down bitter rival Old Dominion in Norfolk this past Saturday. It was a great test prep for this MTSU team as ODU plays at one of the slowest paces in the country (342nd out of 351 teams) and defends incredibly well. The Rams did a solid job of hitting shots in that one but were once against hampered by turnovers, turning the ball over 18 times in the win against a top-40 turnover defense in Old Dominion. Turnovers will no doubt have been a major point of emphasis by Will Wade and his staff in their full week of prep for MTSU. Wade commented that one of the key causes of VCU’s turnover issue was guards driving to pass inside the arc instead of players driving to kick it out for open threes. VCU has been prone to major cold streaks on offense but overall have been a solid shooting team on the season. VCU’s 52.7% effective field goal percentage ranks in the top-100 and is the best at VCU since the 2003-2004 season. If VCU can continue that pace while limiting turnovers, the Rams become a much more dangerous offensive unit. VCU will also need an improved shooting Mo Alie-Cox to take down teams like MTSU. The Ram big has hit just six of his last 18 attempts and is shooting under 50% inside the arc for the first time of his career. Alie-Cox’s 48.5% FG% is his lowest of the season and is down roughly 13% from a year ago. 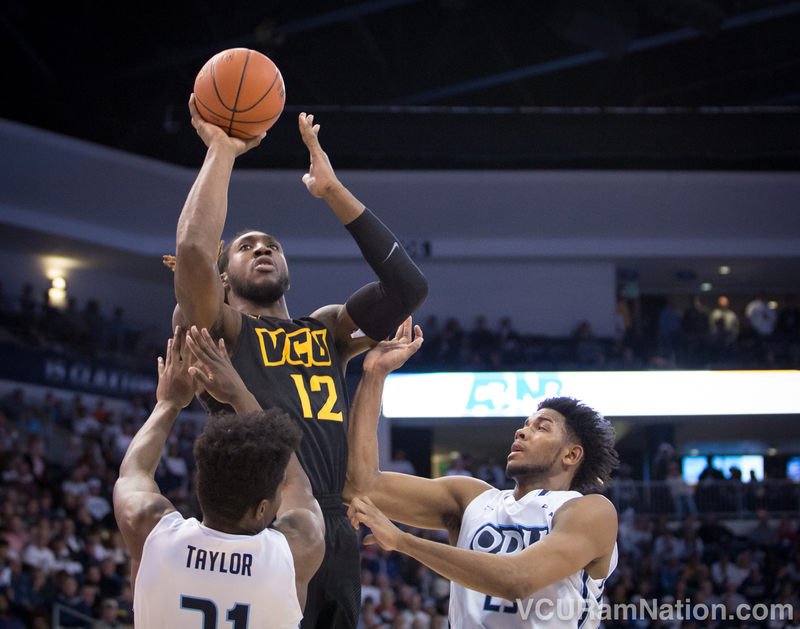 Freshman De’Riante has been a major bright spot for VCU. The top-50 recruit scored 11 points in his 21 minutes at ODU and leads VCU’s double-digit minute players with a true shooting percentage of 66.2%. His 113.5 offensive rating is second on the team to only Justin Tillman who is once again shooting over 60% from the field while also improving his free throw shooting to 73.7% this year, up from 56.6% this past season. VCU’s average margin of victory win hitting 20 or more two-point shots is 19 points per game. Anything less than that and things get tight. The Rams hit 18 twos in their 3-point road win at ODU, 18 in a close 6-point win over a pretty bad St. John’s team and hit 17 in a narrow escape (five points) at Liberty (kenpom No.242). VCU made 17 two-point shots in close losses to Baylor and Georgia Tech and just 14 twos in a 18-point loss to a so-so Illinois team. VCU also has a team goal of 12 turnovers, a number they’ve hit just three times this season: versus Binghamton (12) and against St. John’s (9) and LSU (8) in the Bahamas. VCU is averaging 19.3 turnovers per contest in their four losses this year, which includes a 25-turnover performance in an exhibition loss to DII Queens University (who, by the way, is ranked 4th nationally in that division and is undefeated). If MTSU wins the battle of the paint, I think they win and potentially win by double-digits. JaCorey Williams and Reggie Upshaw very much resemble the front courts that have given VCU fits, both on offense and on D and can effect VCU’s ability to do what they want to do: finish inside the arc. The Blue Raiders have turned teams over an average of 22.3% of their possessions while block another 10.7% of possessions. That’s basically one third of teams’ possessions wiped out, meaning teams have to make shots count or risk being what will be one of MTSU’s many victims this season. If VCU can’t get it going offensively the black and gold are looking at two consecutive home losses for the first time since January of 2015. Kenpom: 69-64 VCU win with a 68% chance of a Rams victory. Watch: ASN, Official game day headquarters are Buffalo Wild Wings locations at Virginia Center and downtown on Cary Street in Shockoe Bottom.